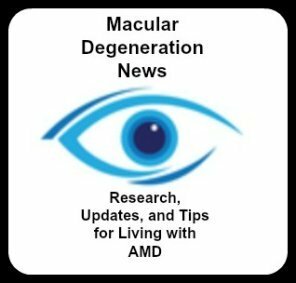 Macular degeneration and stem cells are the focus of research by several biotech companies in the United States and world wide that seeks to use regenerative medicine to treat many different retinal conditions. The cells being used in this study are called allogeneic cells (another source other than the patient) versus autologous cells which come from the patient. Therefore, patients will receive immunosuppressive drugs for three months after the transplant. 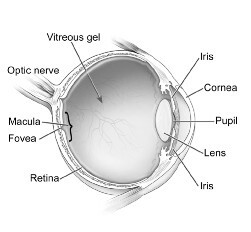 The Study of Human Central Nervous System Stem Cells (HuCNS-SC) in Age-Related Macular Degeneration is a Phase I/II clinical trial seeking to determine the safety of a single injection into the retina using human central nervous system stem cells in those with geographic atrophy due to macular degeneration. "In June 2014, based on positive interim results, Stem cells, Inc. closed enrollment earlier than planned in its Phase I/II clinical trial to assess the tolerability, safety, and preliminary efficacy of sub retinal HuCNS-SC transplantation in GA-AMD." These cells are adult (non-embryonic) stem cells with previous research showing that these cell have been shown to engraft and survive long term. Four patients have been transplanted with a single dose of 200,000 HuCNS-SC and as of September 2013, a 5th patient has received a 5x higher dose of one million HuCNS-SC. A press release from StemCells, Inc. announced on May 22, 2014 that it has transplanted HuCNS-SC® (purified human neural stem cells) into the first five patients in the final cohort of its 16-patient Phase I/II trial for geographic atrophy. Each of the eight patients in this second group will receive a dose of 1 million stem cells into the most affected eye. Patients will be evaluated for signs of visual improvement by using conventional and state-of-the-art methods and equipment. "We are very pleased with the rate of progress being made towards our goal of completing enrollment in this study by the end of this quarter," said Stephen Huhn, M.D., FACS, FAAP, Vice President, CNS Clinical Research at StemCells, Inc. "We look forward to releasing the first interim results from this study next month and are planning to initiate a controlled Phase II proof-of-concept study later this year." "In addition to a favorable safety profile for our HuCNS-SC platform technology, the interim results for the Phase I/II trial have demonstrated either stable or improved visual acuity and contrast sensitivity at 6 and 12 months post-transplant. The interim results have also revealed that most study eyes have had lower growth rates of GA than the control eye (fellow eye). The changes in rate of GA are unexpected and suggest that the HuCNS-SC cells may affect the underlying cellular loss in AMD." As of January 2016, this clinical trial has been suspended until a funding partner can be found. Autologous stem cells are cells that are taken from the patient's skin or blood cells and then given back to the patient via different transplant procedures. The loss of cells in the Retinal Pigment Epithelium (RPE), a layer of the retina that helps to nourish the macula contributes to age related macular degeneration and loss of vision. The Moorfields Eye Hospital in London is seeking to generate and in the future transplant a layer of healthy RPE cells. Stem cells can be produced by "winding cells backwards." A patient's own skin or blood cells can be reprogrammed to become what is called induced Pluripotent Stem cells (iPSC). According to the researchers for the Production of iPSC Derived RPE Cells for Transplantation in AMD study, "It has been shown specifically that this type of stem cell can be produced from adult human skin cells or blood cells can in turn be converted into Retinal Pigment Epithelial (RPE) cells. These RPE cells are a very important cell type in the human retina that are abnormal and ultimately lost in Age-related Macular Degeneration (AMD). Although it has been shown to be possible to make RPE cells from adult human skin, it has not been done to a level to fulfil regulatory requirements for human transplantation in AMD." This study is not for the purpose of treating AMD but rather to see if iPSC cells can be used as a source of tissue for future transplantation. This feasibility study will start with a sample size of 10 patients to see if this method of creating an iPSC-Derived RPE cells from a patient's own skin or blood is safe, effective and a feasible way to perform future RPE transplantation. 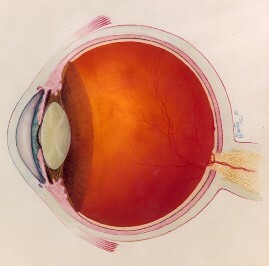 The Ophthalmology Times article of June 15, 2015, Bone marrow cells show promise in degenerative, ischemic retinal diseases, states that "Intravitreal injection of autologous CD34+ stem cells from bone marrow may be both feasible and well tolerated in eyes with degenerative or ischemic retina diseases, said Susanna S. Park, MD, PhD, " professor, Department of Ophthalmology and Vision Science, University of California-Davis Eye Center, Sacramento. Six patients (6 eyes) who were diagnosed with retinal vascular occlusion, dry AMD or retinitis pigmentosa received an intravitreal injection of autologous CD34+bone marrow cells in a pilot study. The study's aim is "to evaluate both the safety and feasibility of intravitreal autologous CD34+ bone marrow cells as a potential therapy." On January 3, 2011, Ocata Therapeutics announced that the United States FDA approved their application to treat advanced dry age related macular degeneration using retinal pigment epithelial (RPE) cells derived from human embryonic stem cells. This macular degeneration research involves the cells that are found in a layer of tissue that lies under the retina. There are three layers of tissue that support the retina - the choroid, Bruch's membrane and the retinal pigment epithelium. Many people have ethical concerns regarding the use of embryonic stem cells. Here is the company's response to this issue. According to Gary Rabin, former Ocata's chief executive, "Ocata uses a proprietary technique to extract a single cell from a young embryo, allowing the rest to remain intact and develop normally." This single cell biopsy does not destroy or harm the embryo. The completed Phase I clinical trial focused on safety. Subsequent clinical trials will focus on the effectiveness of the stem cell therapy. The hope of future studies will be to show that the RPE cells that are injected into the retinal space will be capable of slowing or possibly halting the progression of dry macular degeneration. There is even some hope of potentially even restoring some lost visual acuity. Transplanted patients have been followed up for a median of 22 months. "There was no evidence of adverse proliferation, rejection, or serious ocular or systemic safety issues related to the transplanted tissue." According to the Ocata Therapeutic's October, 15, 2014 press release, "In addition to showing no adverse safety issues related to the transplanted tissue, anatomic evidence confirmed successful engraftment of the RPE cells, which included increased pigmentation at the level of the RPE layer after transplantation in 13 of 18 patients." The first site participating in this clinical trial was Jules Stein Eye Institute, UCLA School of Medicine in California. As of November 2015 several other sites have been approved by their Institutional Review Boards such as Massachusetts Eye and Ear Infirmary, Wills Eye Institute in Philadelphia, Pennsylvania and Bascom Palmer Eye Institute in Miami, Florida. In September 2015 the first patients have been enrolled in the Phase 2 study. Unlike the Phase 1 study that compared the study eye to the patient's other eye, this trial will compare stem cell treatment to a group of patients with the same diagnosis who are receiving a placebo. The study has reached its number of needed participants and is no longer recruiting patients. There are five arms to the study with each group or cohort receiving increasing numbers of stem cells. “We expect this Phase 2 clinical study will provide important information about the ability of Ocata’s fully differentiated RPE cells to treat dry age-related macular degeneration, when transplanted into the retina,” commented Carl D. Regillo, MD, FACS, Director, Retina Service at Wills Eye Hospital and Professor of Ophthalmology, Jefferson Medical College. In a July 12, 2012 update, Ocata Therapeutics reported that the fourth patient treated for Stargardt's received the higher dose of 100,000 human embryonic cell-derived RPE cells at Will Eye Institute. Prior patients received a 50,000 dose. Patients with better vision, a visual acuity of 20/100, will be eligible for enrollment in the remainder of the trials. "By treating patients earlier in the course of the disease, the Company believes that the amended patient protocol will have a more significant impact on photoreceptor rescue and visual function," according to the ACT media update. The previous requirement for Stargardt's patient was a visual acuity of seeing no better than hand movement and dry AMD patients required a visual acuity of 20/400 to be eligible. Each participant will receive a single sub retinal infusion into one eye of MA09-hRPE cells in one of 4 dose levels. Six weeks after the first patient in each dose cohort receives the cell transplant, the Data Safety Monitoring Board (DSMB) will review the clinical data and recommend if the next two patients in the dose cohort may be treated.